It’s Showtime friends! Ben and Grandpa Max are on a TV show to play exciting human cannon and win some money. The Ben 10 Stinkfly Showtime game brings all the fun at your fingertips as you help Grandpa Max to shoot the Stinkfly into the air as far as you can! Are you excited? Well, just hold your nerves for a moment and first check out the gameplay details below. The Ben 10 Stinkfly Showtime game based on circus-themed TV show where Grandpa Max and Ben went to enjoy! The duo sets out to try their luck on the human cannon to win cash prizes. Ben converts into the Stinkfly and sit in the cannon while Grandpa Max takes the responsibility of firing the cannon. There are numerous cash bags floating in the air which Stinkfly needs to collect! The more bags you collect, more cash prize you win. Recommended: Enjoyed this game? Play the exciting Ben 10 Alien Force game online now! 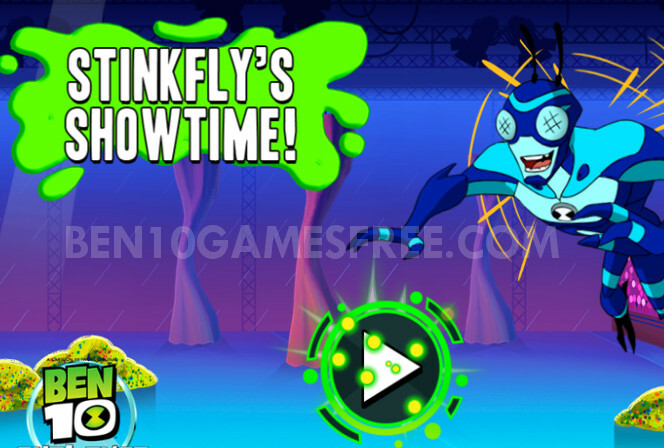 Ben 10 Stinfkfly Showtime is a multi-level ben 10 game with 40 different levels to play. Each level has a target of cash to be collected and a limited number of throws that Grandpa Max can fire. You get to play as Grandpa Max and help him shoot Stinkfly in the right direction. Click and move the cannon head to aim in direction you want to shoot. A green dotted path will help you see where Stinkfly will fly if you fire, so always consider that. Once you have finalised the direction to shoot, just release the button and Grandpa Max will fire the cannon. The Stinkfly will automatically collect the cash bags which comes in his way. To make the game even more exciting, there are various obstacles in the way like walls, bouncing surface, blocks and the flying squad which stops Stinkfly for flying further. As you complete levels after levels, some powers get unlocked like Goo, Double shoot and Fly Over etc to help clear difficult levels. If you could not achieve the given cash target in the given number of throws, you fail and the level restarts. It’s Show time! Make Stinkfly shoot from cannon and collect thousands of dollars in cash! Don’t Forget to give your rating for Ben 10 Stinkfly Showtime game and share your tips and tricks to win this game in the comments section below.